Go help JessaLu break her personal best for number of comments on a post and you could win a skein of sock yarn or hank of roving. Leave your comments before midnight EDT today (April 16). I’ve actually started a sweater for myself! It’s the zip-front hoodie from Knit So Fine: Designs with Skinny Yarn. I may or may not actually knit the hood. I have a lot of time to decide on that, since I’m knitting the sweater on US3s from the bottom, using black Jaeger Trinity, which is a discontinued cotton/silk/nylon blend. At the rate I’m knitting, I should finish this sweater in 2011 or so. Want to see the cables in detail? Clicking on it won’t help. But I’ll wait while you verify that. Yup, I bet you’re already looking forward to the next two years worth of progress pictures on this project, eh? 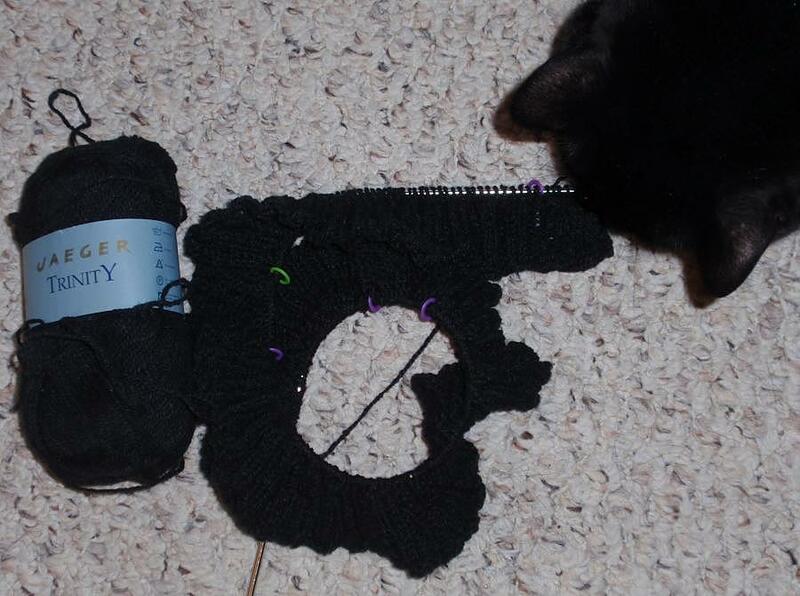 Posted by Chris on Thursday, April 16th, 2009, at 3:00 am, and filed under Contests, Knitting. that’ll be a very pretty sweater! The very last thing I ever expected was you knitting a sweater for yourself. 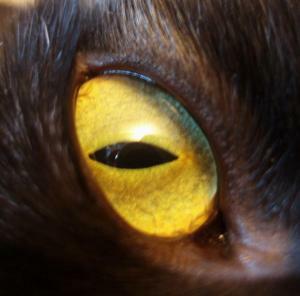 I could have guessed it would be black…after all the family must stay in sync. I have that book too! Don’t you just love it?! How much extra time would be added by knitting the hood??? I *love* that sweater. Definitely knit the hood! Chris- In for a penny…you have to do the hood. LOL – looking forward to more photos in progress! Black yarn on #3 needles? You are a glutton for punishment. But the result will be worth it. It will be an awesome sweater when its finished.. though boring in between, unless you find some way of figuring out how much cat hair it attracts per month of knitting. Unlike Marina, I won’t faint that you are knitting yourself a sweater. Now if the sweater weren’t black, then I’d faint. Someday, you’ll knit some friend a pink or yellow sweater, tell us you’re knitting it for yourself, and then we’ll all be struck dumb. 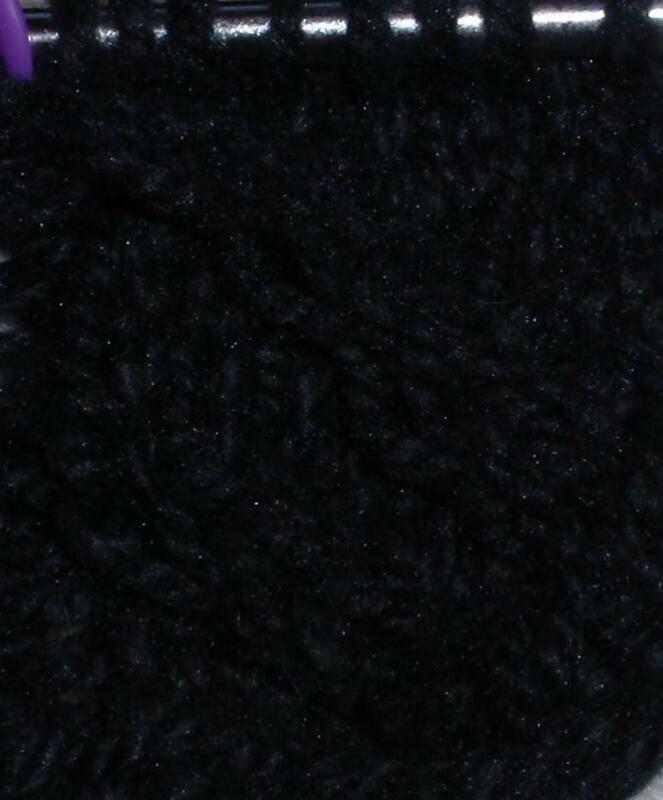 That is a lot of tiny black to knit – I hope you’ve got an ott light and some super good glasses ready for that. I don’t think I’ve recovered from the black Irish Hiking scarf yet. You could’ve shocked us by knitting something pink for yourself – that would totally knock me over. cricket loves the color choice she says black is very stylish! but a black sweater on us 3s? wow. just make sure you finish it before winter or you’ll go blind!! Are you going to try a zipper? That might make the photo easier…. 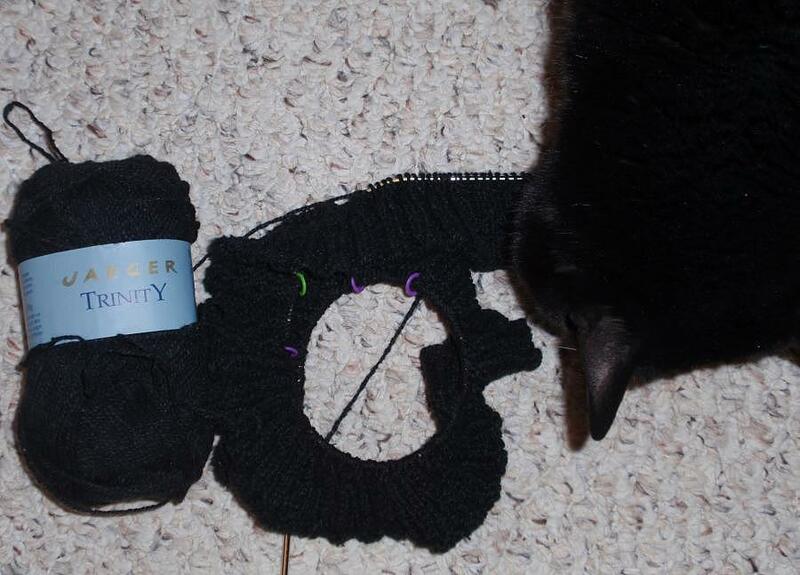 black yarn, black WIP, *and* black kitteh goodness! love it.